Prof. Dr. Kamal Kant Dwivedi is presently the Vice Chancellor of ITM University, Gwalior. He is also the President of Global Academy of Doctorates. He is a Scientist, Researcher, Teacher, Educator, Administrator, Diplomat and Science Communicator. For over 42 years he served in India and abroad in different capacities. Previously, Prof. Dwivedi served as the Vice-Chancellor, Arunachal University, Vice Chancellor of Apeejay Stya University, Head of Division, Adviser, and Director in the Ministry of Science and Technology, Govt. of India, Counsellor (Science, Technology,Health and Education) at the Embassy of India, Washington DC, Visiting Professor/Scientist, University of Giessen, University of Marburg and Hahn-Meitner Institute, Berlin, Germany and Faculty member at North-Eastern Hill University, Shillong. During his tenure as Vice-Chancellor of Arunachal University, now a Central University renamed as Rajiv Gandhi University, Prof. Dwivedi steered that University to become a ‘University with Potential for Excellence’ the highest UGC recognition. Prof. Dwivedi has significantly contributed to enhancing scientific understanding by participating in over four hundred scientific conferences,symposia and seminars, by chairing technical sessions and delivering plenary and invited talks. His area of specialization covers – Interaction of heavy ions with matter, Studies on fusion-fission and particle evaporation in 4-geometry,Development of computer codes for range and energy loss, Heavy ion induced creation of Buckminsterfullerene in graphite, Radiation induced modification of polymers, Use of food animals as indicators of air-pollution, Radon monitoring for Radioprotection and for earthquake prediction, Assessment of breathing level air quality in urban environment. 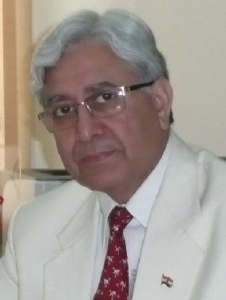 Prof. Dwivedi has been heading a number of National and International professional and scientific organizations as their President, Chairman, Fellow or Member. From 2000-2002, Prof. Dwivedi held the prestigious position of the President of International Nuclear Track Society representing more than 40 countries. He is recipient of 10 different national and international fellowships and “India 2000 Millennium Award (1999)”. Prof. Dwivedi is elected as a Fellow of the Indian Chemical Society (FICS), and also a Fellow of the International Academy of Physical Sciences (FIAPS) since 2010. He held a position of President of Chemical Sciences for the 100th Indian Science Congress organized in January 2013 in Kolkata. He obtained his Ph.D. in 1977 from I.I.T. Kanpur and M.Sc. in 1972 from Lucknow University. He has specialized in the fields of Chemical, Nuclear and Environmental Science, Science and Technology Cooperation, Administration and Communication. Prof. Dwivedi pursued research in truly multi-disciplinary areas and published about 200 research papers in refereed journals in the area of Chemical, Environmental, Nuclear and Material Sciences. Some of Prof. Dwivedi’s research work has been prominently cited in Science and Engineering text books published by leading international publishers. Fields of Specialization: Chemical, Nuclear and Environmental Science, Material Science, Educational Planning and Administration, Science Communication and International Scientific Cooperation. Organized “21st International Conference on Nuclear Tracks in Solids” in2002 as International President. Undertaken a major project under UNDP to prepare ‘Human Development Report’ of Arunachal Pradesh. Again, the First University in India to prepare HDR for UNDP. Text book Citation: (1) Research work is cited in the engineering text book of R. Spohr, “Ion Tracks and Microtechnology – Principles and Applications” Vieweg (1990) p.154. (2) My research work is also cited in the book edited by D. Fink, “Fundamentals of Ion-Irradiated Polymers”, Springer Verlag (2004). Over 400 Scientific, academic and technical conferences attended in India and abroad. For about 20 years, He served as a member of the editorial advisory board of ‘Radiation Measurements’ an International scientific journal published by Elsevier Science. Establishing linkages with Professionals of Indian origin in USA by creating an interactive network and database. Organized National Children’s Science Congress involving 12 lakhs children every year. Have been connected with top universities in US, UK, Germany and Australia. Negotiated with US counterparts about the formation of Indo-US Bi-National S&T Commission and a $ 30 million endowment in 2006. I steer the nation-wide programs to stimulate scientific temper through S&T communication. I am also associated with several other important activities such as development of scripts, films, video and radio programs, books, impart training for school teachers, science communicators, capacity building,coordinated with State S&T Councils and Networks. Conduct outreach and extension activities including National Children’s Science Congress, Science Day celebrations, and running of “Science Express” an innovative Scientific Exhibition on wheels. President, International Nuclear Track Society (INTS) and member of the International Governing Body from 1985-2004. Chairman, Programme Advisory Committee of Ecology and Environment of ILTP, Department of Science and Technology, Government of India. Chairman, Executive Council, Planning Board, Academic Council, Selection Committees and Finance Committee of the Arunachal University. Member of the International Scientific Network Society, Rome. Member of the Executive Committee of IANCAS. Member of the Program Advisory Committee of the National Science and Technology Management Information System (NSTMIS), Department of Science and Technology, Government of India. Member of the Court of Nagaland University as a nominee of the President of India. Member of the Board of Management of the North-East Regional Institute of Science and Technology (NERIST), Itanagar as a nominee of the Ministry of HRD. Member of the Society of Indian Institute of Advanced Studies, Shimla. Member of the Society of Nuclear Science Centre, New Delhi. Nominated as a member of the International Organizing Committee for the international conferences on SSNTD held in Beijing (1992), Dubna (1994), Cairo (1996), Besancon (1998), Ljubliana (2000), New Delhi (2002) and Barcelona (2004). Also I have delivered a number of Invited talks and chaired several technical sessions. Biographical citation appearing in Marquis Who’s Who in the world, in the Dictionary of International Biography, IBC, Cambridge and in the “Honors Edition” of Cambridge Who’s Who among Executives and Professionals. President, Chemical Sciences, 100th Indian Science Congress. Governor’s Nominee in the Executive Council of CSM Kanpur University since 2014. President’s (Visitor’s) Nominee for all selections of Mizoram Central University since 2015.